Of all the surprises to come out of the CES show this year, Palm’s revival as a serious player in the handheld device market is perhaps the biggest of all. Most people – myself included – had long since consigned Palm to the dustbin, confident that it would never re-invent itself out of the hole it had fallen into, out-manouevred and out-featured by rival devices. The initial reports coming from CES are that the Palm Pre is an excellent device and offers the iPhone some proper competition. And at least some of that success might be because the team at Palm has a few former Apple employees on board. Partly because my first ever PDA was a Palm, and I was a happy Palm user for many years. I don’t want to see the company fail. And partly because any serious competition for Apple is a good thing – anything that gets people umming and ahhing over whether they should buy an iPhone or a Pre will make Steve Jobs sit up and start paying attention when people ask for simple, basic stuff like copy/paste and syncable text notes. UPDATE: I’ve just noticed that this post is very similar to another post by my esteemed Cult colleague Mr Mortensen not four hours previously. My apologies for the repetition. At least we can be sure that two great minds here think alike. I’m not having a good week, am I? I hope they succeed too. But in my hope they take more share away from Microsoft until MS gives up and goes away. They’d probably buy Palm and screw it up though. Or Blackberry and screw that up. These are tough times, I wish them all the best. Don’t forget that if Palm does well it’s likely at the expense of MS (noted by OlsonbW before me) and those annoying Crackberry people. Those guys are worse than (us) Fanboys. The Pre looks like a fairly nice device but Palm has it’s work cut out for it. Apple probably sold close to 18 million iPhones in 2008 and it’s stock got cut to shreds. The economy in 2009 looks to be worse than 2008. Palm has got to move at least 4 million of these Pres starting from the middle of the year until the end of 2009. I don’t know what they’re going to charge for this Pre, but they’re going to have to be competitive to get any traction. Any major problems or sales lags from this Pre and Palm will probably run out of money. 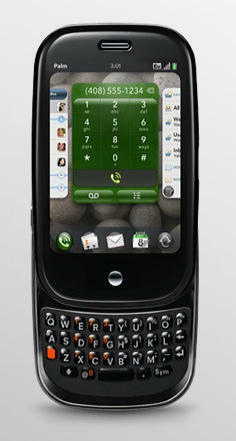 Before getting to Apple, Palm has to get past Android devices and definitely RIM’s BlackBerrys. I think WinMo devices are going to lose more market share to other OSs. As far as Palm kicking the crap out of the iPhone, it really isn’t likely to happen. The App Store is still gathering steady steam and iTMS is rock solid for music downloads. The iPhone 3 should be out around the same time as this Pre and it could be a killer with updated hardware and OS (Snow Leopard Mobile). All eyes are on iPhone 3.0; if the next iPhone ups the ante, it will blow past the Pre. I think that the Pre will take more from Blackberry than it will the iPhone. The people who require keyboard will go for one of these two. you are not. For everyone else there’s iPhone. The Palm Pre is a lot smaller than I initially thought it would be. A good size comparison would be an iPod classic with a big hard drive. In terms of thickness, it’s definitely not as thin as the iPhone, or even the bold, but it’s an acceptable size considering it’s a slider. The Pre is the first phone to make the iPhone look old and outdated. The phone is beautiful and from the looks of it, offers great GUIs too just like the iPhone. However, the GPS and QWERTY keyboard could be the deciding factor on its capability to start grabbing some slice of the mobile market pie. By all means, I think Palm Pre and the iPhone is aiming for a different market segment. Palm, true to its core, would appeal more to business people. Therefore, its main competition would be the Blackberry and the other Windows Mobile phone out there. iPhone since the beginning has been catering to a different market, which, lucky for them, turns out to be pretty big. I’d like to comment on the keyboard. I know that most reviews of Palm products with a similar keyboard (at least from the photos it looks very similar to my Treo 755p). CNet always slams the Palm keyboard, but I’d like to comment that unless your fingers are pretty large, you can actually easily type on this keyboard one-handed, versus say a full slideout keyboard like the HTC Touch. I tried the HTC, and to type on the larger keyboard required me to put the device on the table and steady it (since half of the phone was in the air unsupported). With my Treo, and I’m assuming the Pre, I can type very quickly with one or both thumbs. The bubbled design actually helps with this. I will note however that Palm replaced my Treo within it’s years warranty, and a month later it crashed and it’s been unsyncable since. Somehow I’m still holding out for Palm to finally make a comeback though and get it right this time. Now here’s my question, to my knowledge Skype never supported Palm, at least not the Palm Garnet OS. I was told that Gizmo supported Palm OS but I’ve never been able to get it to download onto my memory card and work. Does anyone know if Skype, Gizmo, or something similar will be supported on the Pre? This is a must have feature for me for any new phone that I get as one of my best friends is paralyzed (quadriplegic), and can only call me online via Skype. The only way I can actually call him is if I’m at my computer. Somehow this would seem to be a no brainer for an internet capable phone. Anybody know whether Skype or a Skype-like product will work on the Pre.